Lambert holds an MFA in Metalsmithing from Cranbrook and degrees in Psychology, Art History and American Studies from Wayne State University. 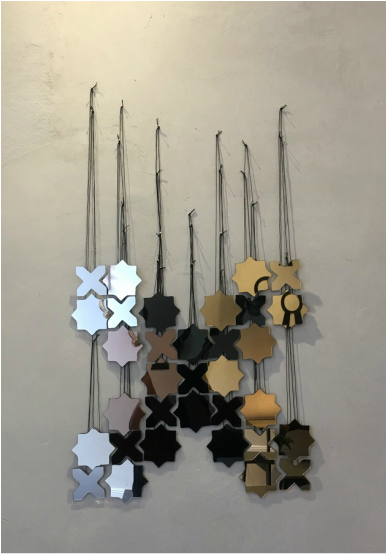 In 2016, Lambert became the first international artist trained in jewelry/metalsmithing to be invited as an international resident for IASPIS, the Swedish Arts Grants Committee, and also received a re-invite for significance of research. Lambert has received collaborative grants from the Norwegian Indigenous Arts Council and the City of Prague Foundation. Lambert’s work has shown at venues such as ArkDes, Walker Arts Center, the Queer Culture Center and has had solo exhibitions at Platina Gallery, Stockholm, ATTA Gallery, Bangkok, Sculpture Center in Ohio and a solo feature at the Benaki Museum in Athens Greece. Lambert is currently an MA candidate at Warren Wilson College in Critical and Historical Craft researching fixity in relation to indigenous and other minority education structures to engage with western craft pedagogy and the relationship of craft to nation-state structure and nomadism. Lambert is an active contributor to Art Jewelry Forum, Metalsmith Magazine and Norwegian Craft. They have recently been awarded the winner of the JAC (Global Fashion Jewelry and Accessories Council) award "Top 100 Designers".